Red Nose is a winter warmer that does not get too sweet, while maintaining a little bit of a hop bite to keep things interesting. The beer pours with a dark brown / reddish coloration. The effervescence of the beer ensures that any head that is present dissipates quickly. There is a toasty side to this effort that will keep individuals warm through the coldest months of winter, while the near-7.0% ABV of the beer will amplify this warmth nicely. The Red Nose continues to shift and change as the bottle warms up; a sweeter side of things can be discerned at about the midpoint of the beer. The grain hints interact with the bitter elements to establish something that is wholly unique and looks to expand the definitions of what a winter warmer is and can be. 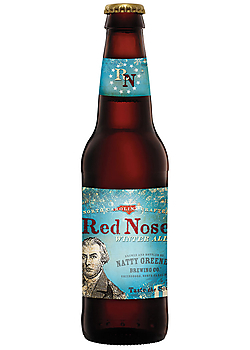 Visit the Natty Greene website for more information about the brewery, their offerings, and the slate of food that they offer – the Red Nose can be purchased as a seasonal offering from October to January. The beer keeps nicely and should be searched out as one’s earliest opportunity.